New iPad Pro 10.5(2017 Model). Leather outer with vivid color printing,feel free to wipe the dust or water drop off,no need to worry about any scratches to your iPad. Soft TPU inner case ensures easy snap-on without any scratches,at the same time,it'll hug every edges of your New iPad Pro 10.5 2017 securely. High Shock-absorbing Silicone Plastic Features:Water-proof,Shock--proof,Anti-dust,Snow-proof,Kids Friendly. UNOTECH iPad case combines durable protection with fashion design, protecting every corners and the back. Considerate flexible loop design for holding your stylus pen around anytime anywhere. Build-in magnets will trigger the automatically wake/sleep function of your iPad, effectively save power all the time. Backside could be transformed into a kickstand, provide adjustable viewing angles while watching videos or face time call. Thoughtful wallet design provides you space for at least 3 cards, carring around all your important cards or notes while on the go. Specially designed for New iPad Pro 10.5 Inch 2017 Released Tablet. 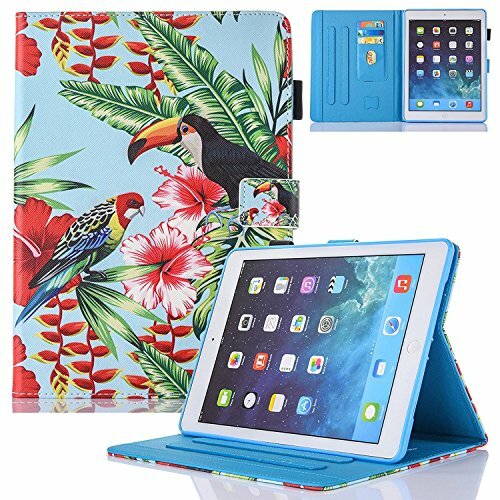 Shock proof iPad case is made of leather feeling synthetic leather; the inner holder is made of soft silicone, easy to install and take off without scratches. Flexible strap design can hold your stylus pen in different size, definitely a good resolution when you need to carry it around and prevent from losing. Build-in kickstand and 3 slots allows propping up your iPad when watching videos and placing at least 3 cards or bills while on the go. Build-in magnets will trigger the automatically wake/sleep function of your iPad,effectively save power all the time,magnetic closure will also securely close the case. If you have any questions about this product by UNOTECH, contact us by completing and submitting the form below. If you are looking for a specif part number, please include it with your message.